From the outbreak of war in summer 1642, Cromwell was an active and committed officer in the parliamentary army. Initially a captain in charge of a small body of mounted troops, in 1643 he was promoted to colonel and given command of his own cavalry regiment. He was successful in a series of sieges and small battles which helped to secure East Anglia and the East Midlands against the royalists. At the end of the year he was appointed second in command of the Eastern Association army, parliament’s largest and most effective regional army, with the rank of lieutenant-general. 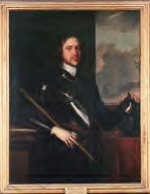 During 1644 he contributed to the victory at Marston Moor, which helped secure the north for parliament, and also campaigned with mixed results in the south Midlands and Home Counties. In 1645-6, as second in command of the newly formed main parliamentary army, the New Model Army, Cromwell played a major role in parliament’s victory in the Midlands, sealed by the battle of Naseby in June 1645, and in the south and south-west. When civil war flared up again in 1648 he commanded a large part of the New Model Army which first crushed rebellion in South Wales and then at Preston defeated a Scottish-royalist army of invasion. After the trial and execution of the King, Cromwell led major military campaigns to establish English control over Ireland (1649-50) and then Scotland (1650-51), culminating in the defeat of another Scottish-royalist army of invasion at Worcester in September 1651. In summer 1650, before embarking for Scotland, Cromwell had been appointed lord general – that is, commander in chief – of all the parliamentary forces. It was a remarkable achievement for a man who probably had no military experience before 1642. Cromwell consistently attributed his military success to God’s will. Historians point to his personal courage and skill, to his care in training and equipping his men and to the tight discipline he imposed both on and off the battlefield.